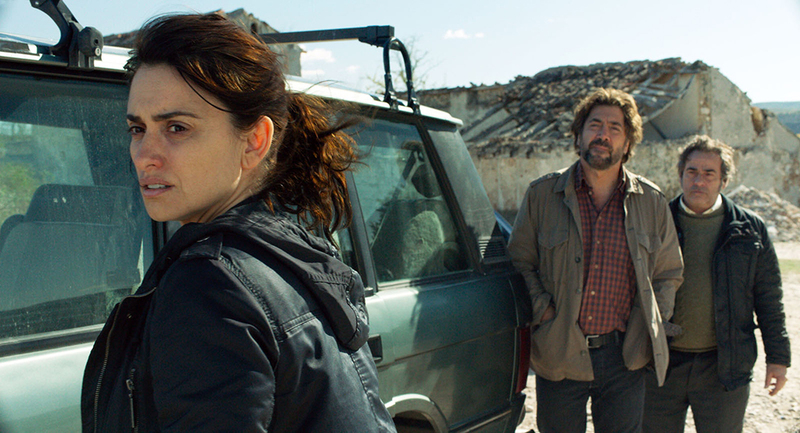 Now two years later, Farhadi has directed his first Spanish-language feature, and it’s another winner. “Everybody Knows” stars the versatile Penelope Cruz as Laura, the mother of a teenage daughter and an elementary-aged son. Laura and her children travel from their home in Argentina back to her hometown near Madrid to attend the wedding of a family member. During their time in Spain, the daughter Irene (Carla Campra) befriends a local teenager named Felipe (Sergio Castellanos) who introduces her to motorcycle riding, trespassing inside the town’s clock tower, and other aspects of the teen wild life. During their time together, Felipe informs Irene that her mother Laura had a long romantic relationship with family friend Paco (Javier Bardem, in his meatiest role since “No Country for Old Men”). Upon her surprise, Felipe simply says, “Everybody Knows.” This would appear to be the impetus for the film’s title. Then the night of the wedding reception, Irene doesn’t feel well and retires to her room early. Later she turns up missing, and kidnappers begin to text ransom demands to Laura’s cell-phone – and to the cell phone of Paco’s wife Bea (Barbara Lennie). Strongly advised by the kidnappers not to involve the police, Laura complies. She tearfully calls her husband in Argentina, who quickly hops a plane to Spain. He’s played by the prolific Argentine actor Ricardo Darin. The set-up mirrors that of “The Salesman,” although this screenplay (written by Farhadi himself) is more fully-realized. As the days following the wedding proceed, dark secrets are revealed, forcing friends and family members to confront not only past relationships, but also past business deals. Paco makes the extremely generous offer of selling his half of his winery to his business partner to produce the ransom. Why? Again, secrets are revealed. Consequently, the film’s title turns out to be multi-faceted, as various confidential information is shared amongst those involved in resolving the kidnapping. A big shout-out to Penelope Cruz is warranted, as she turns what could have been two hours of “crying mother” syndrome (that we might find in a television movie treatment of this material) into perhaps the finest performance of her career. Cruz is mesmerizing as she struggles with juggling all the information and suggestions of others (including a retired police investigator who provides undercover assistance) with the occasional triggers that remind her of her missing daughter. Perfectly composed and intelligently balancing scores of details one minute and then collapsing into the reality of her situation the next, Cruz has never been better. Ironically, “Everybody Knows” was not nominated for Best Foreign Language Film, although next to Alfonso Cuaron’s “Roma,” it is the best I’ve seen. My usual fear is that not enough filmgoers will seek out this film, as it is subtitled. And that’s a shame. “Everybody Knows” has a very contemporary and, dare I say, “American” sensibility about it. This is the type of picture that could have been set in any large American city, and worked just as effectively.